Approaching it years later leaves one fumbling at where to begin. 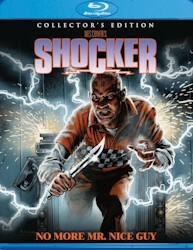 After all, Shocker is the horror genre (if not Craven himself) as a snake eating its own tail: having just reinvigorated the slasher genre five years earlier with Nightmare, the director returned with this turbo-charged riff on the late-80s pop horror culture he unwittingly helped to usher to the screen. Craven famously never directed any of the proper Elm Street sequels, but Shocker perhaps offers a glimpse into what might have been. Like those later sequels, it isn’t particularly interested in delivering actual horror as much as it just wants to deliver something—anything—for its audience, and it does so at a breakneck pace that leaves them wondering just how in the hell they zigged and zagged from point A to point Z. 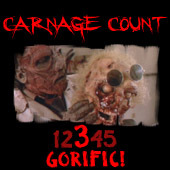 Despite his pronounced limp and his motor mouth, Pinker somehow eludes the police force and begins to personally terrorize Jonathan and his girlfriend Allison (Cami Cooper), a development that doubles as a hint that Shocker doesn’t intend to exactly settle down. Just when it seems to be a typical “maniac –slasher-on-the-loose” premise, it introduces premonitions and cryptic dialogue, the latter of which doesn’t remain much of a mystery for very long once the police (and Jonathan, who is allowed to accompany them, which I assume is not protocol) finally apprehend Pinker and put him on the path to the electric chair. Because the film clearly operates in fantasy land, Horace is tried and sentenced to death in the blink of an eye (seriously, maybe a few months pass), but not before he manages to perform a Charles Lee Ray-esque séance with his television set, rip out a guard’s tongue, and laugh his way through execution. When Pinker’s charred, electrified corpse is finally left a smoking husk, it’s exhausting and astounding since over half the movie somehow remains.